Things are better now for our president. This before and after shots say it all. It was only yesterday I was telling a mate how rapidly Prime Minister David Cameron and President Barack Obama have physically aged since they got into power. Not so in Nigeria, here, it’s the ‘Benjamin Button Effect’ going on in Aso Rock. Forget good luck, this is fried rice and big meat chunks. Hat-tip to Linda Ikeji Blog for the photo. I like his cheekbones. I like how he and Madam Patience are tight like that. I'd pick him in a beauty contest against Obama / Sarkozy. But Michelle will win the battle of the wives to me. Lol! 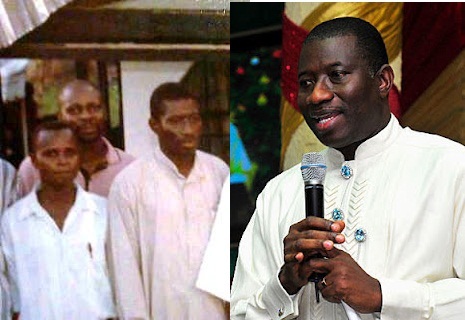 While I'll say bravo to the one who "unearthed" this picture, I disagree a bit with the statement that Gej "has no troubles" and therefore hasn't aged. That's false. The dude might have gained a few pounds but every morning the strands of very grey hairs keep multiplying. Yes, his actions as a leader have been dull (very dull), but trust me, when I see Gej on Tv it's quite evident that he isn't exactly having it easy, at all. But again, I'll savour and bask in the joy of having this juxtaposition.